A few nights ago, I watched an episode on Teen Mom OG and it infuriated me so much. It was a very emotional episode! For those who don't know it is a documentary based TV show that revolves around the lives of Teen Mom's. It began when they were '16 and Pregnant' and followed with 4 seasons of 'Teen Mom'. The 3 girls are now back with new episodes but they are all in their mid-twenties now. Teen Mom: The Original Girls. 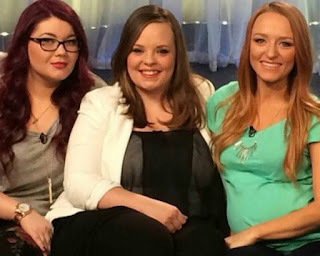 Catelynn and Tyler: Tyler posted a video of his daughter who was adopted and adoption parents were angry. My heart broke for this. I can understand how Cate only cares about HER seeing her daughter and not worrying about the public seeing posted pictures and videos but at the same time, it was suppose to be an open adoption. That involves having the right to post pictures of your daughter. She is still their daughter even though they're not the parents. If anything, Carly is so lucky to have not only 2 families that love her but also so many viewers that adore her. Amber: Baby daddy drama after she gets out of jail. what did Amber expect when she went to prison! I don't think she has changed at all and she always makes Gary seem like the ad guy in front of Leah. No you don't do that; you act like something else is bothering you. You don't put the other parent in the bad light. Gary is trying to put a schedule on for the benefit of your child and you were the one that ran over time and promised something you knew you could not fulfill. Maci: Having to deal with her baby daddy not willing it communicate. She is probably one of the most patient and admirable mothers out there. Not only is she amazing with Bentley but she knows how to co-parent and she tries. Even when Ryan shows up late-AGAIN-she is still patient. I hope the conversation helped she forced him to have, finally changed but I doubt it. It has already been 6 years so why would he change now. I think, in all honesty, he should have no time with Bentley until he starts to pull his weight. Clearly all responsibility is on Maci and Ryan needs to step up.